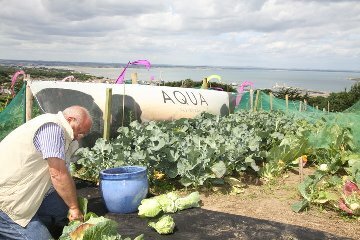 In January 2010 we began work with an allotment on Howth Hill with the aim of growing as much of our own ingredients as possible. We have come a long way since then with numerous herbs, potatoes and vegetables. Despite a few weather-related setbacks, our garden is blooming and producing nicely! We try to update our blog on the development of the garden, so please feel free to check in for updates on our work and for some interesting recipes and tips for growing your own. Here’s to an utterly organic Aqua! We started blogging a few years ago on the kitchen garden, going forward we plan to continue to talk about our garden but also to share recipes. Our aim will be to generally keep it interesting!